Although we visited on a Thursday, because of the festival it was pretty busy, so expect queues this weekend. There is plenty of parking though, and on busy days they have stewards pointing you to where the spaces are. Getting from the carpark to the entry involves a few wide steps, you might be able to get a buggy down them, but I usually walk on the road, would be better if the step free access didn't involve walking on the road, but thankfully it isn't usually that busy. I had our huge all terrain double buggy with us, but actually any stroller would probably do you as the roads are pretty easy to navigate. 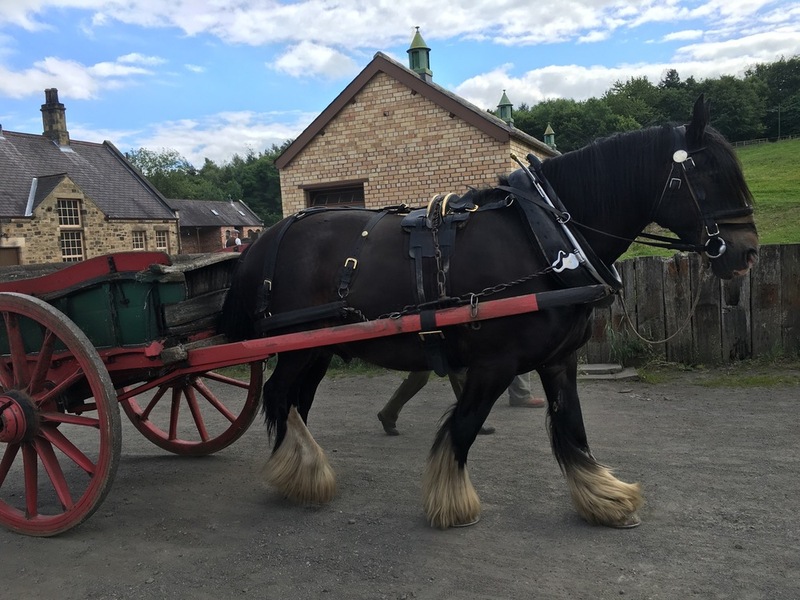 I would recommend trainers or something that won't give you blisters as if you aren't using the transport then a visit to Beamish involves a lot of walking. The queue to pay was moving quickly. Bonus if you are an annual pass holder as there is a separate queue and when we visited it was much shorter. We were in within 5 minutes of joining the queue. 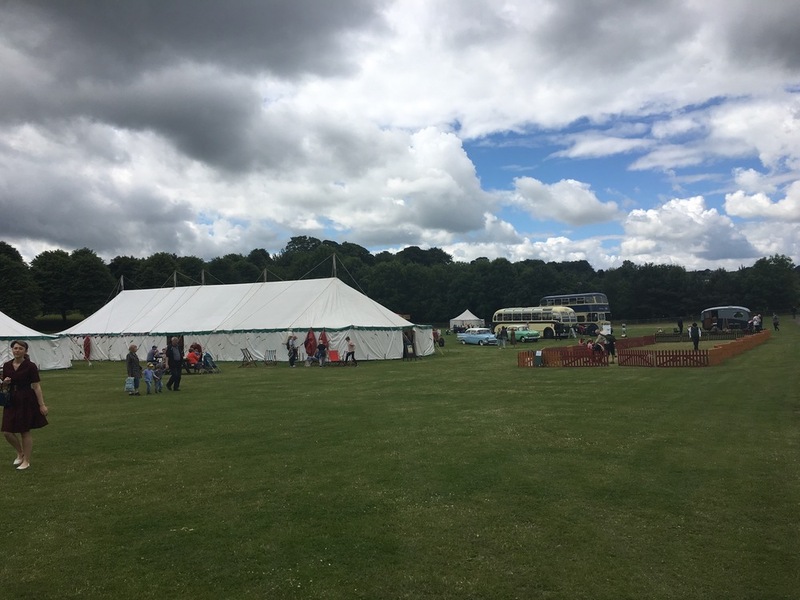 The festival is on the grassed area behind the fairground. 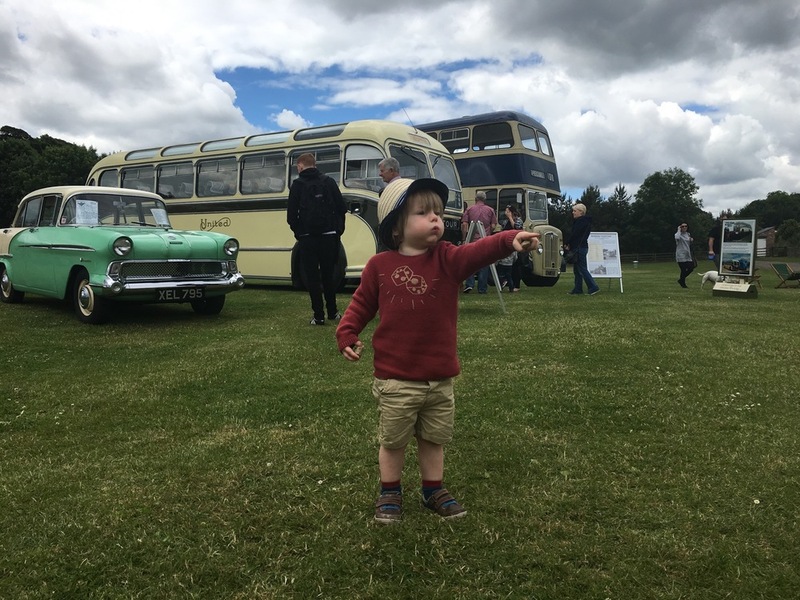 There were a few marquees, lots of vintage vehicles, some fairground stands and areas to play games. 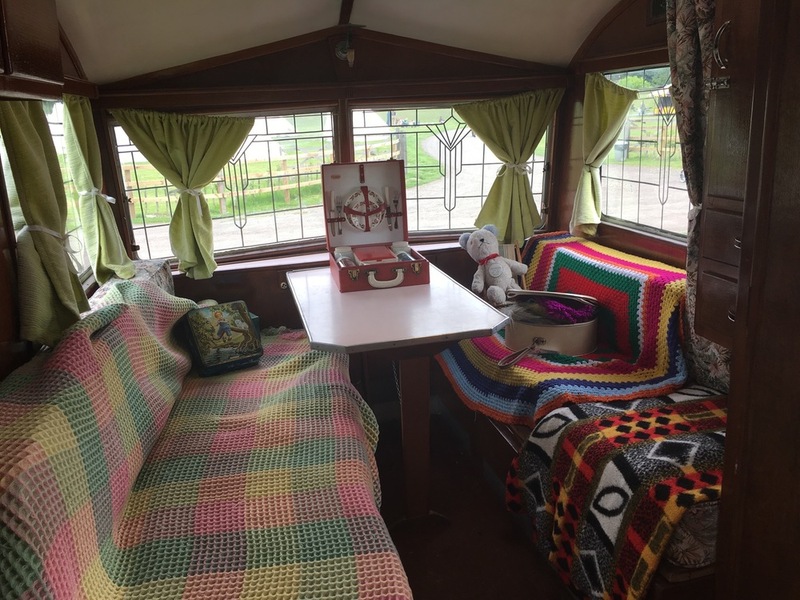 There was a caravan which we had lots of fun going in, and the staff were lovely to my toddler telling us that we could play with anything we wanted in there. The vintage fairground equipment was gorgeous. There were three different stalls, I think that they all cost £1.50 to use, and you paid for these in cash to the operator as opposed to the usual Beamish fairground where you swap your money for tokens. 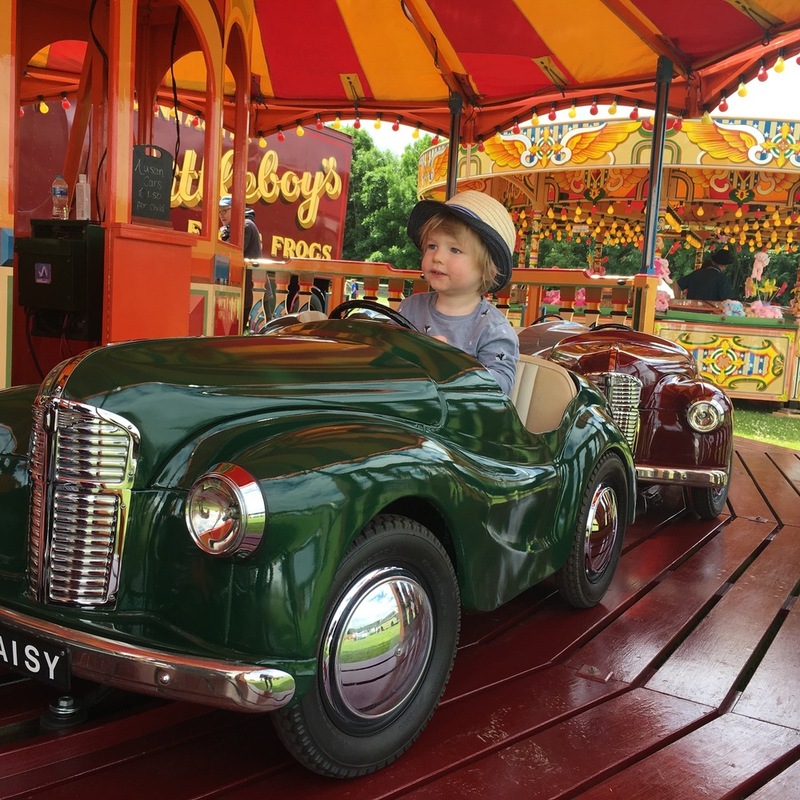 I didn't have any cash on me so had to peel a crying toddler out of the Austin cars without him getting to go on it - so if you think you'll want to use any of fairground attractions then take some cash with you. There were two main marquees. One was half cafe and half set up for a the musicians, there was a large dance floor area, this had been decorated really nicely with bunting. We caught 10 minutes of a skiffle band who were brilliant, my toddler was dancing along with the music. Over the weekend they have loads of different musicians planned, and you can even take part in dance lessons. 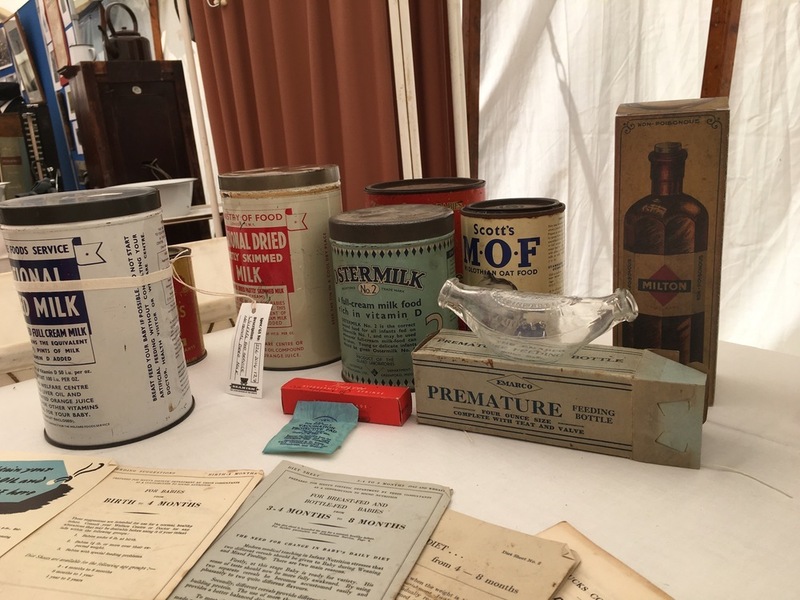 The other marquee was a collection of the 50s items that Beamish have. These had been separated into areas, such as a health clinic, police station and hairdressers, where there were staff on hand to style hair into victory waves, there was a small charge for the hair styling but I didn't see how much. We spent most of our time in this area next to the health centre where they had a collection of children's toys. My baby and toddler played here for about half an hour, and the member of staff in this area was great with them, singing nursery rhymes and telling us about the toys which were popular in the 50s. We didn't spot the gardening section of this tent until I'd already loaded them back into the buggy, but I know my toddler would have had great fun foraging in the muck. There was a craft table where you could make rosettes, but with the lure of toys near by this activity didn't stand a chance with my toddler, but i'm sure older kids would enjoy it. Over the weekend Beamish are also having some competitions, dress in your 50s finest and enter the Mr and Mrs Beamish competition, there is also a competition for best dressed for under 16s. On Sunday there is a football tournament which people can take part in too. All the information can be found on the Beamish Museum website. We had such a lovely day. I'd gone just with the kids, and in the hassle of getting a toddler, baby and myself up and out I considered just not bothering, but I'm so pleased that I did. We were there for ages, and there was loads to hold our attention. As ever with Beamish I did clock up a few miles (My iPhone tracker said we'd covered 3.5 miles in total), and when the sun came out at the same time as me tackling some of the steep hills I got pretty sweaty, but it was definitely worth it. 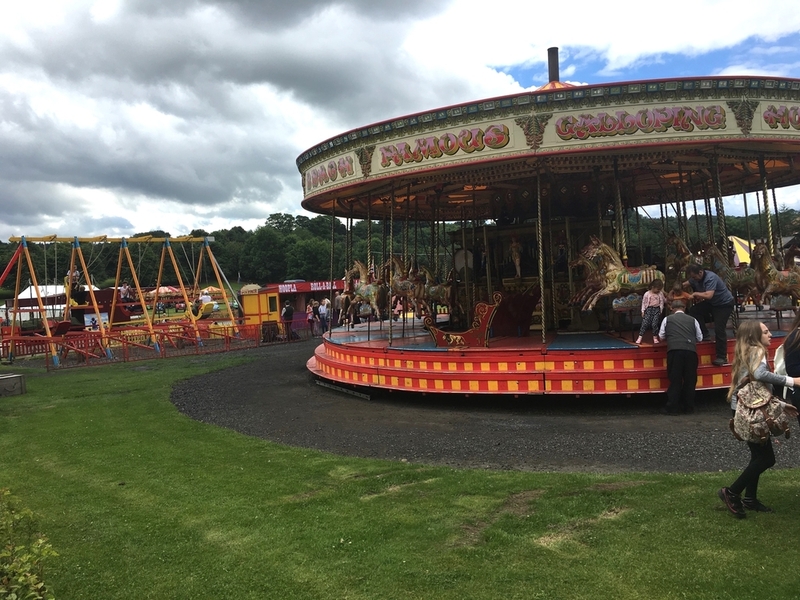 Beamish regularly hosts events on a weekend, so if you are planning to go then check the website to see what is on. We went to their flag weekend earlier in the year, and it was great. There is always such a fun atmosphere about the place during events with lots of games to take part in and even more pieces to interact with than normal. Beamish is open every day, and although it is much quieter on weekdays its still a great place to visit with plenty of things to do to entertain my toddler. Beamish is huge and you could spend days here properly taking in all of the history of the different areas, houses and businesses, I'd never be able to fit all of it into one review, so instead i'm just going to focus on our regular haunts, the bits we return to time and time again. We rarely go into some of the areas which are most popular such asa the sweet shop, dentist or down the pitt as they aren't very feasible with a buggy and two small people, but there are plenty of blog posts and reviews with photos of those areas if that's what you are looking for. In this post though it'll just be the places we visited on Thursday which tends to be the places we go to most often. Transport: My toddler loves watching all of the different vehicles and calling them out. 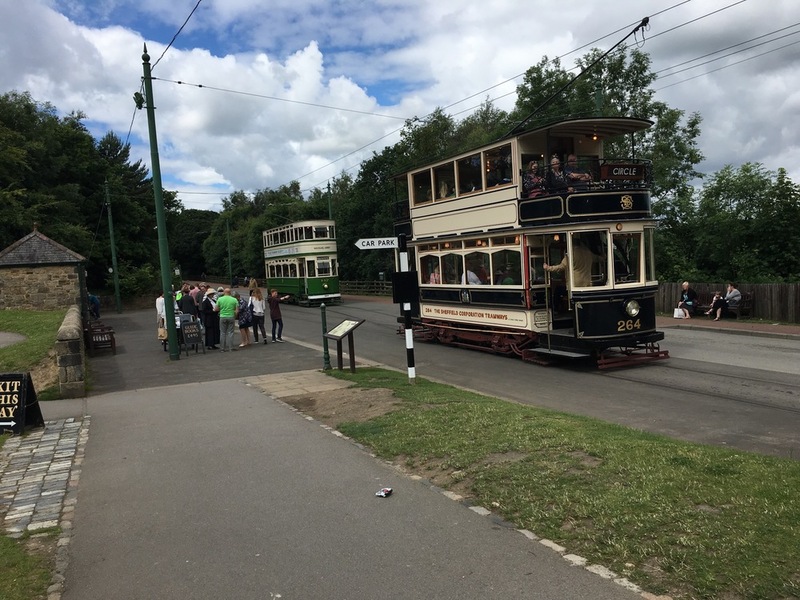 The tram greets you almost as soon as you get through the main entrance and it can take you all of the way around Beamish. 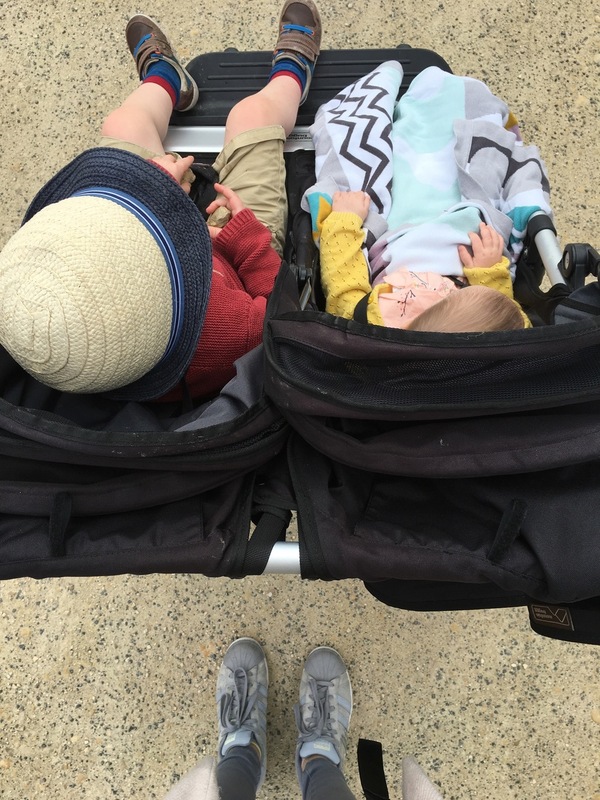 We have never been on it, as it seems like such a hassle to put down the buggy to go on, and because I'm always hoping I might burn off a few calories to shift my post-preggo extra lbs. Even so we like to wave to the tram and i'm sure once we aren't weighed down with the buggy we'll definitely get on there. There are also busses going through the museum, and our favourite is the steam train which I think only runs on a weekend. It wasn't running on Thursday but is very impressive when it is. The Town: There is usually a bit of hustle and bustle in the Town even on the quietest days. 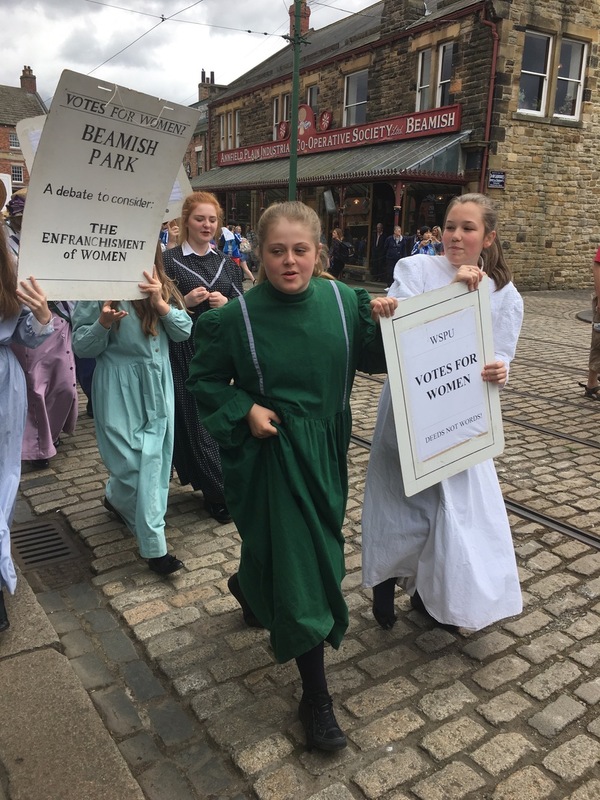 On Thursday we caught protests for and against women's right to vote. We didn't go in on this occasion but we'll often call into the garage for my toddler to look at the cars and bikes they have marvelling at the size of the penny farthing. The Town also has the grassed area and bandstand area close by so we'll sometimes grab a coffee and cake (always amazing) from the tea room and eat them out on the grass or take a picnic with us. This area is pretty much enclosed so my toddler can run around a bit. A change station can be found here too, but annoyingly they don't have a toilet in there too. So when I needed to change the kids I had to go to the baby change, then leave and take them into the toilet with me too. 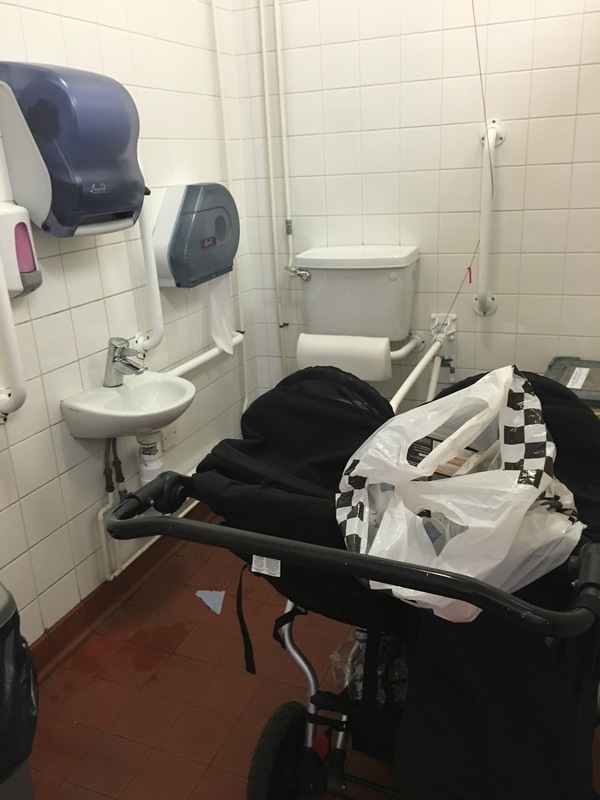 Thankfully the double buggy fit into the disabled toilet in the women's loos so I didn't need to leave them outside or balance the baby on my knee whilst I go to the toilet (from experience that isn't great) but I much prefer when there is a loo in the baby change as I feel guilty using the disabled toilets especially if the change table is also in there as sometimes I can be in there ages. 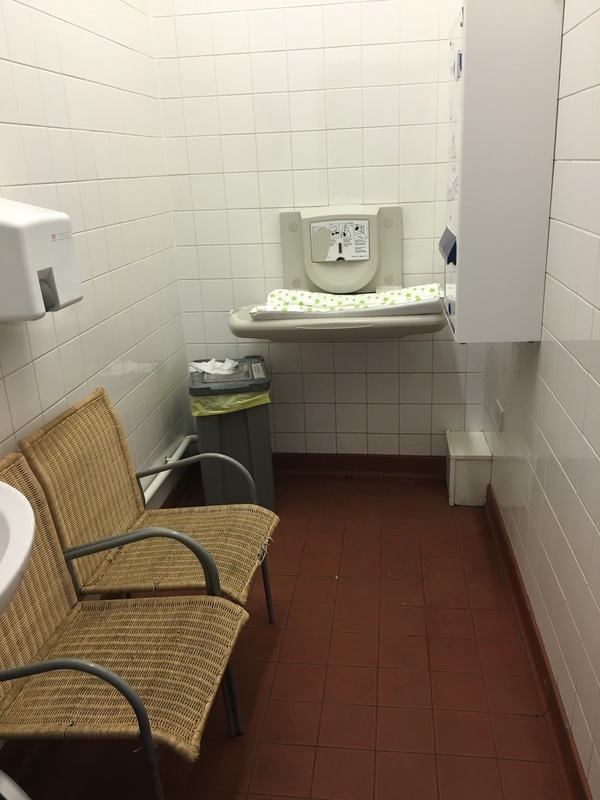 There are also changing facilities near the main entrance which do have both a change table and a toilet in there. The Fairground and Sandpit: This bit is probably our favourite. My toddler is too young for the fairground attractions but we like to look and he loves the giant sandpit with buckets, spades and sifters. There are even adult and child sized deckchairs to sit on too. Animals: The animals are always a big draw for us. 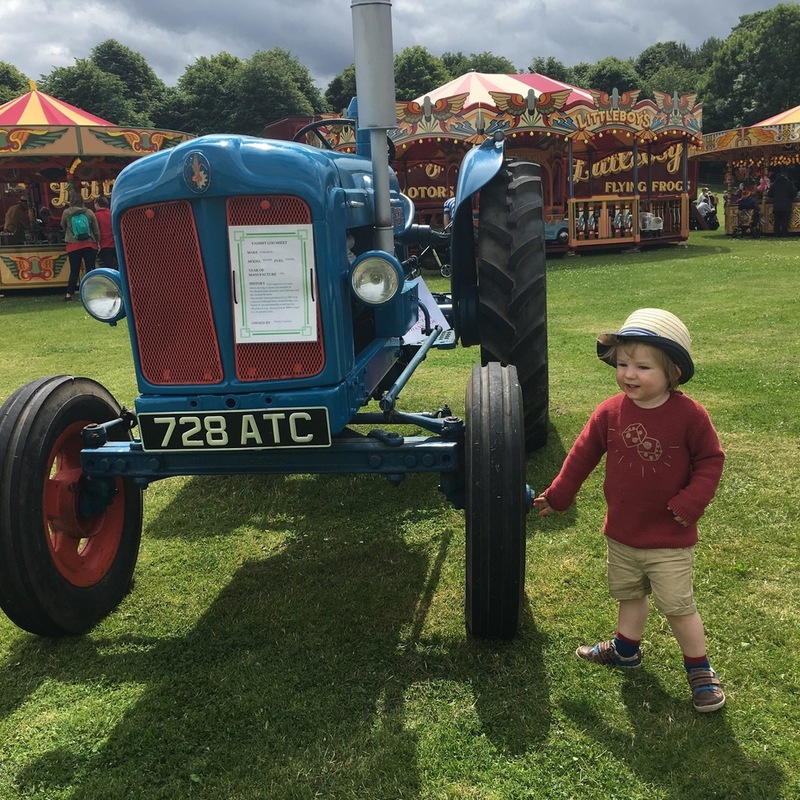 Whilst you don't get the hands on interaction that you do at places like Hall Hill or Whitehouse Farm, my toddler always loves going to visit the animals. The actual farm was a bit depleted this visit with us only spotting geese and chickens, but usually we'll see pis, sheep and cows in there so presumably they were all in the fields this visit. In the past we have even seen a lamb being born. 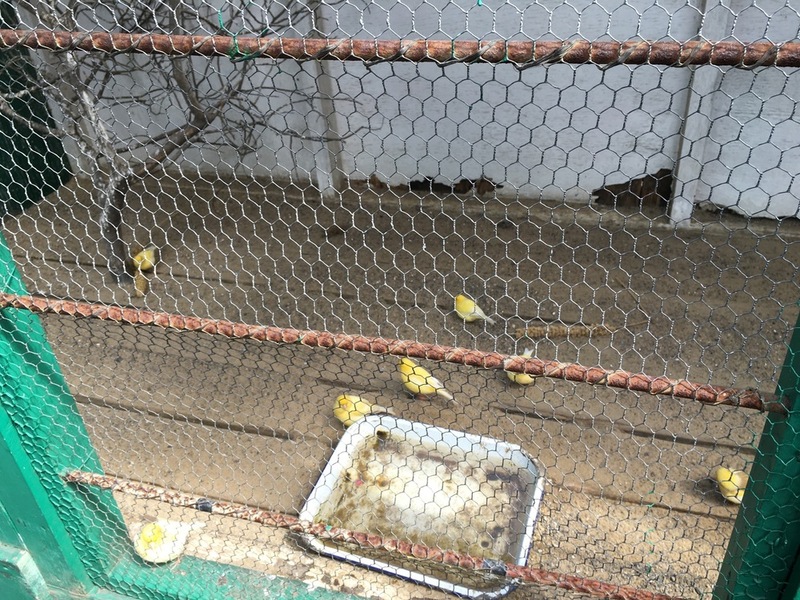 There were still other animals to see though, horses, a goat, rabbit and birds were all in the Pitt Village. We didn't go into the school this time, but its another place my toddler likes with a rocking horse, hopscotch and writing slates. That was the end of this visit. Like I said before in my post about the Centre for Life I like having annual passes, and the freedom it gives. Adults are £18.50 for the year, and under 5s are free, having the annual pass means that we can always choose to come for a couple of hours on the spur of the moment, or that we have a really nice free day out available when we are skint (hello statutory maternity pay). I know we've had value for money from it as i've been so often. 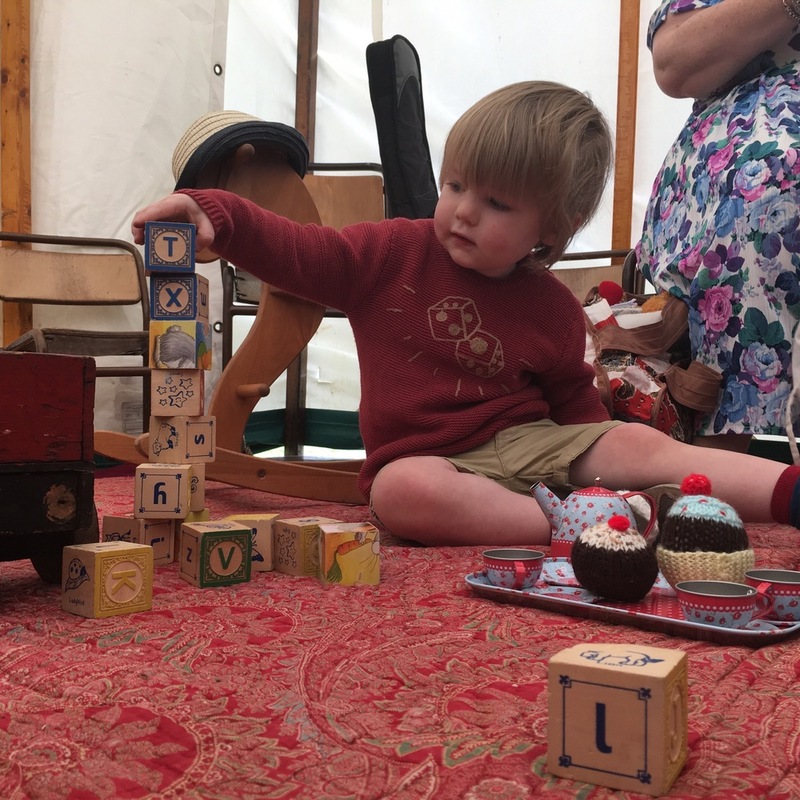 I never seem to be free for it, but during term time Beamish Museum also runs a toddler group in the hall in the Pitt village. We were visiting once and called in, there were toys, songs, and the kids even got a snack and drink, it was included in the annual pass, so a really good option for anyone who lives local to the museum. 31st October 2016 to 7th April 2017 - Open daily, 10am to 4pm. Closed Mondays and Fridays from 2nd January to 17th February 2017. Do you love Beamish as much as me? Leave us a comment letting us know what your favourite bits are. Please use the links to find me on Facebook, Instagram or Twitter for photos, blog posts and ramblings.